There are always a few different ways you can figure out it’s fall: The air begins to crisp; certain animated GIFs of dancing pumpkin-people return to the internet; and monsters are eventually mashed. But one sure sign autumn is upon us is when everyone heads off to go pick apples. If you want to get out of DC traffic and into nature, then hop in a car and head toward Virginia, where you will find yourself with seven different orchards to choose from. Here are some of the best apple orchards in the state. Start your dive into the season by visiting farmland couched in comforting green housing 30 acres of apple trees, 15 acres of peach trees, and a bakery that’s open on the weekends. Stroll through the quiet of the fields. Stumble across quietly stacked boxes of beehives and wonder how the honey tastes. (Don’t pull a Winnie the Pooh and try and steal some honey. There’s plenty back at the Orchard’s shop.) Take in the already-ripe apples that have fallen off the branch and clustered into a pond-like collection beneath the tree. 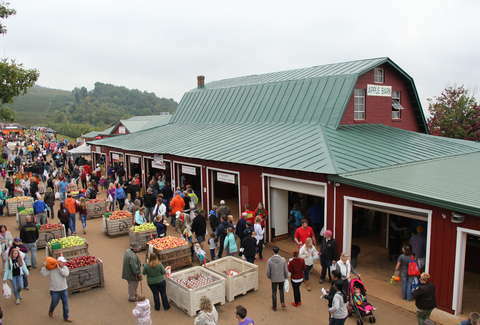 Slightly southwest of Charlottesville is Dickie Brother’s Orchard. It’s set in a portion of the landscape that seems to be even more expansive than the landscape that surrounds Stribling. It’s one of Virginia’s oldest continuously operating farms, too, soldiering on in one form or another since 1750. If their harvest calendar is any indication as to what you should keep an eye out to get, then you should be on the lookout for Red Delicious, Empire, and Granny Smith apples. Did you know that there’s such a thing as a "Summer Rambo" apple? It’s a much more entertaining corruption of the word "Rambour d'été" -- as in, an apple that’s grown in France in the summer -- and it’s one of the many apples you can find at the Hartland Orchard in Markham, Virginia. You can also see if the cows will follow you up the road, as this video sought to investigate. 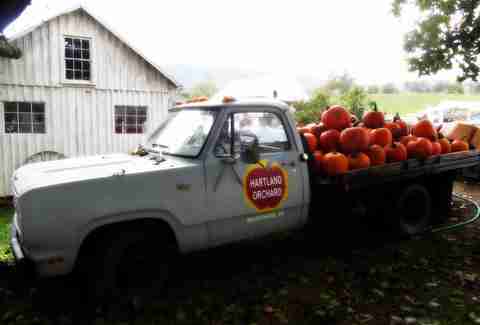 At Drumheller's Orchard, you’ll have Jona Gold apples waiting for you (which means you can get a sense of how apples tasted for some folks in the 1820s) as well as Grimes Golden (which is native to Virginia) and Mutsu apples (which are not native to Virginia; they originate in Japan). There’s also Stayman, Winesap, and, if you're lucky, a late-season selection of peaches. The Gala apples are ready, and the gorgeous views continue at the Carter Mountain Orchard in Charlottesville, Virginia. 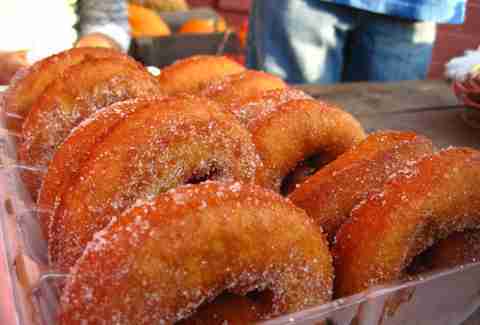 Go for the cider donuts. Go to gather on the hill with others to watch the sun set. Go bring your dog; let them run around. Go for the on-site tasting cellar, which will top your day off nicely. There’s a little bit of everything here: In addition to the apples, there are pumpkins and grapes to pick, fish to fish, wagon rides, and more. Apple-wise, they have Gala, Jona Gold, Jona Free, Candy Crisp, Fuji, and Ruby Jon varieties in September and early October. Evan Fleischer is a writer-at-large. In addition to having bylines in The New Yorker, The New York Times, The Guardian, The Washington Post, and numerous other publications, he also was this close to creating a villain in a play that was "a waiter who takes orders from no one."